In an age of high-profile corruption scandals, one country is stealing headlines left and right. Altamar’s 14th episode takes a close look at Brazil, where a massive anti-graft investigation is sending shockwaves around the world as it topples powerful business leaders and politicians. And with one of those politicians currently polling first in Brazil’s presidential race, things are only bound to get more complicated. Peter and Muni are joined this week by Andrea Murta, a political risk analyst and Director of North American operations for Brazilian legal news portal JOTA, and Diego Werneck Arguelhes, professor of law at Brazil’s prestigious Fundação Getúlio Vargas. With former President Lula da Silva’s recently upheld corruption conviction throwing his candidacy into doubt, Andrea and Diego help break down what might happen in October’s elections. 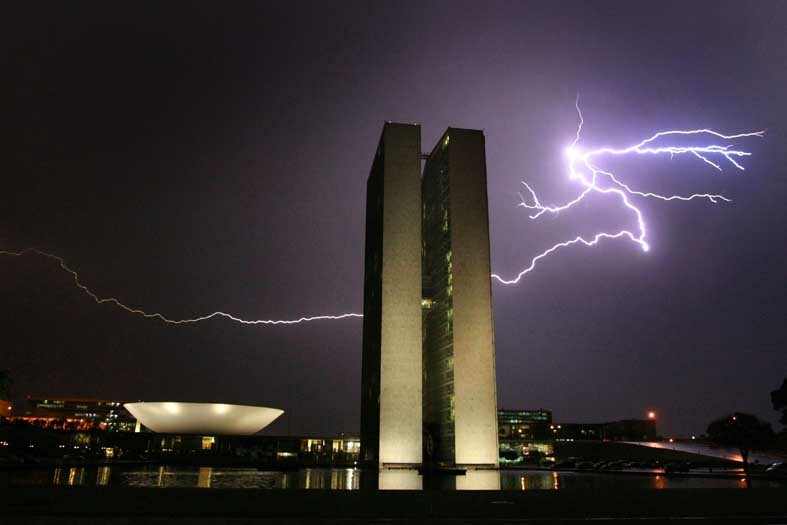 They also lend their insight on what exactly has made Brazil’s judiciary the powerhouse it is today, and whether the sweeping investigation that has won hearts abroad could risk inflicting collateral damage at home. Having worked extensively in Brazil, Peter says Lava Jato, as the anti-corruption investigation is called, is precisely what the country needs to combat a culture of graft. “Corruption has always been one of the biggest ills in Brazil, and the shock therapy being administered by these judges is something very positive,” he says. Still, he fears that the onslaught of revelations and convictions in the lead-up to an election could have some unsavory consequences. “My only worry is that—like in Italy, where out of Mani Pulite came a 15-year right-wing disaster in the form of Berlusconi—out of Brazil’s anti-corruption drive we may get Jair Bolsonaro,” Brazil’s ultraconservative firebrand, whose pro-dictatorship, anti-civil liberties rhetoric has propelled him to second place in the polls. Unfortunately Peter’s fears are not unjustified. Andrea believes at this point that Bolsonaro is well positioned, particularly if Lula does indeed end up barred from this year’s election. And while she notes that Lula’s legal avenues to candidacy are far from exhausted, Andrea deems his absence from the race more likely than his presence. What’s left in that case is a fractured political landscape that doesn’t bode well for whoever ends up winning in October. But electoral turmoil aside, Brazil’s judiciary has captivated observers worldwide—especially in Latin America, where the country’s neighbors have watched the deluge of high-profile convictions in awe. For anyone seeking to replicate the Brazilian model, however, Diego concedes that pinpointing an exact recipe for success may prove difficult. “The million dollar question is: What has allowed Brazil’s administration of justice to reach this level of efficacy? What’s the secret sauce? But the list of potential factors is pretty sobering,” he says. One of those factors has been a strengthening of prosecutorial autonomy and independence, which Diego warns can be a double-edged sword. While it has allowed for Lava Jato to reach previously unthinkable heights and bring down previously untouchable figures, a lack of oversight can be dangerous. Muni worries that that’s precisely what’s happening in Brazil today. She wonders whether this amounts to harmless public admiration for upstanding professionals, or whether it points to a blurring of the lines between law and politics in Brazil. “It concerns me that this massive corruption investigation, important as it is, may derail and and turn into an overzealous attempt at having the courts run the country,” she says. In the end, however, Muni and Peter agree that Lava Jato and the painful truths it is exposing are a net positive for Brazil. The breakneck pace of this national upheaval has, predictably, brought a degree uncertainty and instability. But if the country can emerge in one piece from the world’s largest corruption investigation—particularly if accompanied by political reform and greater citizen engagement—this bitter medicine may soon pay off.